It’s that time of year to take a look at the season ahead and the story lines that will inevitably surround the Vancouver Canucks. The headline possibilities are endless, here are a few that are sure to revolve around the Canucks this season. NHL Re-Alignment has officially been activated for the start of the 2013-2014 season. The re-alignment will see the new 2 Conference system fall into place featuring 4 divisions rather than 6. Each team team will play each other at least twice [every team will play in EACH arena at least ONCE]. The top 3 teams in EACH division will automatically qualify for the playoffs leaving 4 wildcard spots [2 wildcards per conference go to the teams that have the next highest points below the top 3 in each division; –either there could be 4 qualify from each division OR 3 in one and 5 in the other]. Boston Bruins *The Bruins have locked up Rask following a very good season, eventually locked up Iginla and will be looking to build on the success they had last season. Buffalo Sabres *The Sabres will be looking to have much stronger season and get back to the playoffs. Detroit Red Wings *The re-alignment moves Detroit from the Western Conference to the Eastern Conference. Teams should never take Detroit lightly because despite what some call their ‘aging’ roster, they never stop competing. Florida Panthers *Florida signed the ever colorful Tim Thomas following his absence from the NHL for more than a year and will be looking for the success they had during the 2011-2012 season. Montreal Canadiens *Montreal will be looking to build upon the success of last season when they won their division and push themselves further in the post-season. Ottawa Senators *Ottawa may have lost Alfie to Detroit BUT they gained an offensive weapon in acquiring Bobby Ryan. New captain, Spezza will be hoping to help the team go all the way. Tampa Bay Lightning *Tampa will be looking to return to the playoffs this year. Despite missing the post-season last year, St.Louis led the league in scoring. Toronto Maple Leafs *Toronto returned to the playoffs for the first time in 9 years and will surely want to return to the post-season to erase that game 7 memory. Carolina Hurricanes *Carolina with a healthy lineup and dependable goal-tending could be dangerous. Columbus Blue Jackets *Columbus surprised a lot of people last season as they only missed the playoffs by a single point. The Blue Jackets will look to keep themselves as a contender this year. New Jersey Devils *Brodeur & Schneider in the net give New Jersey impeccable goal-tending. NY Islanders *Newly named captain, John Tavares will be looking to lead the Islanders straight back to the playoffs. NY Rangers *The Rangers will look to push themselves to their best under new coach Alain Vigneault. Philadelphia Flyers *Philadelphia will look to have a turn around year and get back to the post-season. Pittsburgh Penguins *Pittsburgh will want a much a different ending to their season this year and will bring a new determination to their game. Washington Capitals *Alex Ovechkin will be looking to build upon the success the Caps had in the second 1/2 of last season and hopefully help lead them to a long post-season. Chicago Blackhawks *The 2013 Stanley Cup Champions will be looking to carry their success from last season into the current one. With most of their SC roster still in place, they will make a very tough opponent. Colorado Avalanche *Patrick Roy returns to the Avs as the new Head Coach and hopes to lead the team back to the post-season. Dallas Stars *Lindy Ruff takes over as Head coach, Tyler Seguin joins Dallas & Jamie Benn named Captain. Minnesota Wild *The Wild will be looking to push themselves further. Nashville Predators *Trotz will be looking to get the Predators back on track following a year when they were not at their best. St.Louis Blues *The Blues have solidified their defense and will look to build upon their last two seasons pushing further in the post season. Winnipeg Jets *The re-alignment moves them from the Eastern conference to the Western Conference. Anaheim Ducks *Getzlaf and company will be looking to make Selanne’s final season a memorable one. Calgary Flames *It’s a new era in Calgary with Iggy in Boston and Kipper retiring, they will be looking to find new ways to win. Edmonton Oilers *A new coach and a talented young core will make Edmonton a competitor as long as all stay healthy. Los Angeles Kings *LA is a team that no opponent can over look, they are competitors that make their opponents pay. Phoenix Coyotes *Ownership now in place, Phoenix will look to gain back some momentum that they had in the 2011-2012 season. San Jose Sharks *A talented line up and when all cylinders are rolling can be dangerous to their opponents. Vancouver Canucks *With new coach Torts at the helm, the Canucks will look to push themselves to new levels and recapture some post-season success. –The Canucks have won 6 division titles in the last 7 years prior to the re-alignment but this new alignment brings new rivalries to the surface. The Pacific division will not be easy but it will be a great battle to watch as these 7 teams compete for playoff positioning. It will be a tight race, but incredibly fun to watch. Torts Time has officially begun in Vancouver with the signing of John Tortorella as the 17th head coach in Vancouver Canucks history. Heads and eyes definitely rolled initially when it was announced that Torts had in fact been hired by the Canucks as most are aware of his past with the media and passion for the game. The media have reminded Torts of his colored past at every single press conference just to see if he will take the bait. Perhaps he eventually will snap at a member of the media but why goad him into it just for the sake of seeing him snap? How about instead of attempting to see how quick the media can make the coach snap, they focus on how he can help this team. It is going to be a very different year with Torts at the helm of this team and we ought to give him a chance to push this team to their best before we make assumptions. There are 82 games on the schedule, plenty of opportunity for Torts to prove his coaching skills and give the media their desired media bite. Luongo’s Return: It is a return that many did not expect to happen with everything that happened in the last two years with Cory Schneider. It was a draft day trade that no one expected, especially Luongo. The trade was made and now its time to move the focus to this season: Cory is now a Devil and Luongo is the starter for the Canucks…ACCEPT the facts. Luongo is here to stay and he is more than qualified to play as the starter. This year there will be a lot scrutiny surrounding Luongo and all eyes around the league will be on him. This is an opportunity for Luongo to show all his doubters that he is still an elite goal-tender and perhaps the media will actually show him some support this year rather than help to turn the fans against him. It may not have been the outcome most people expected this year, but it is what happened. Time to support the team and that includes Roberto Luongo. Call me crazy but with the Olympics looming, I have no doubts that Luongo will have a big year in more ways than one. A finally 100% healthy Ryan Kesler will be on the Canucks opening night roster. Fans have been waiting nearly two years for Kesler to be starting the season 100% healthy. IF Kesler can remain healthy for the majority of the 82 game schedule, it is possible that we can see him reach an entirely new level. When operating at 100% Kesler is offensively dangerous to all opponents. I think its safe to say that Kesler will be looking to push to a new level with the Olympics on the horizon and the US looking to top their 2010 Silver finish in 2014. Will #beastmode once again be activated? Me thinks, yes. If you’ve seen Kesler at any of the recent press conferences he has a fire in his eyes that wasn’t there in the last seasons, a determination to push himself to an elite level of play. SEDINS=Forever Canucks: The Sedins are going into the final year of their current contract and are looking to sign an extension prior to opening day OR before season’s end. It is not lost on most, that this could be their final contract of their careers and they WANT to remain with the Vancouver Canucks. Management has also expressed that they want the Sedins to remain with the team. Contract discussions have been ongoing since the start of training camp as both sides hope to have a contract signed, sealed and delivered by season’s start. Rumor has it the Sedins could sign contracts with $7.5 million cap hit which have caused some to be shocked BUT you shouldn’t be as they could easily sign for more if they were to test the open market. Regardless of what the final contracts are signed for, rest assured the Sedins will be career Canucks. This is the only team they have ever played for and this is the team they desire to play with for the entirety of their careers. We as the fans, are lucky have watched them develop from rookies to the superstars they are today. SC Battle Begins: The expectations will vary for each team every year BUT one expectation that every team equally desires is to win the Stanley Cup. The battle for the 2014 Stanley Cup begins as the calendar flips to October and will go all the to June. A quest that begins with an 82 game regular season, an Olympic interruption in February, and closes with an epic 4 round battle for 16 post season wins. I’m not saying that the Canucks will win[***but I will love it if they do! ]; all I am saying is that starting tomorrow every team has a blank slate and the season that follows will determine who goes all the way. Starting tomorrow, when the puck drops in the first game of the season, every team has an equal chance and how they play will determine the final outcome. As the off-season comes to a close, it feels like Christmas Eve. Now all we can do, is wait for the madness to begin when that first puck drops and skates hit the ice tomorrow. There will be no turning back, as the quest for the 2014 Stanley cup begins with game one of the regular season. Let the games begin! #HoneyBadger signs for 4 more! Canuck fans will be getting see #36 score many goals like this one, in the next 4 years! Say what you will about Mike Gillis, but signing Jannik Hansen to a $10 million, 4-year extension [$2.5 million cap hit] is an absolute steal. Glad that this deal got done prior to the season. Following the 2013-2014 season, Hansen would have become an unrestricted free agent and easily could have tested the waters of the free agency market next summer [& perhaps have been offered more than $2.5 million]. Hansen signing this contract, it shows to management and the fans that it is not about the money but rather his commitment is to playing the game. It has been fun to see the growth of Hansen as a hockey player from his time with the Manitoba Moose to his tenure with the Canucks; and it will be fun to see him further develop over the next four years. Hansen is entering the prime of his career and has the ability to slot into whatever role is necessary from the third line all the way to the first line with the Sedins whether it is 5 on 5, or special teams. Hansen can be a game changer and hopefully will help this team go all the way in the near future. Congratulations on your new contract, Jannik! Here’s to a great year from the #honeybadger! The LAUG’s representing Raise-A-Reader 2013 in Canuck style! 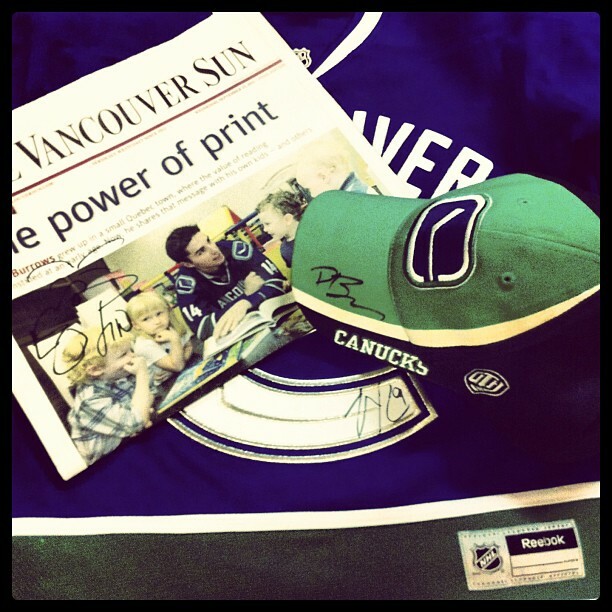 Every year the Vancouver Canucks participate in the Vancouver Sun’s Raise-A-Reader campaign. This year was no exception and they were out bright and early. Vancouver Canucks players downtown is a HUGE draw for fans of the team. The campaign went from 7:00AM-9:00AM. There were representatives from the Vancouver Canucks, Vancouver Whitecaps, B.C. Lions, Global News, and of course the Vancouver Sun. You can guess who I went downtown to see, right? Is it even a question?! Of course it’s my Canucks! Support a great cause & meet part of the team?! It was an absolutely fantastic way to start my day! First meeting of the day: David Booth! Thanks for the photo David! Thanks for the picture Zack! 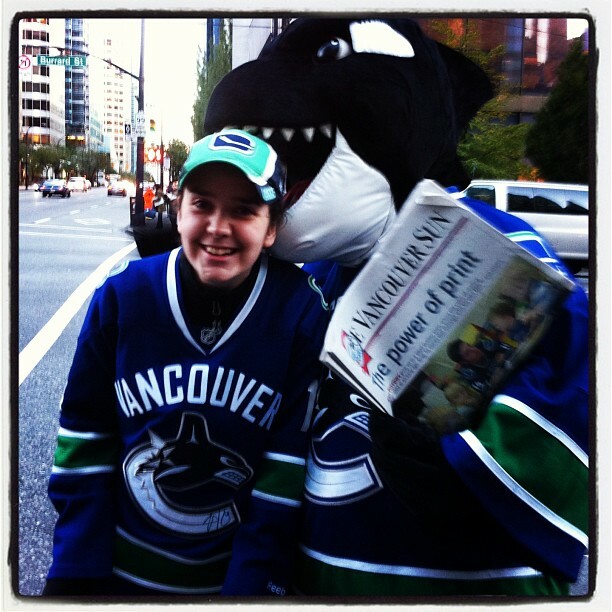 And no Canucks fan outing would complete without a sighting of everyone’s favourite mascot: FIN! FIN always takes a bite when our paths cross! Seriously…every time! Helped the #raiseareader campaign & walked away with the perks of being an early bird! 3 autographs: newspaper[FIN! 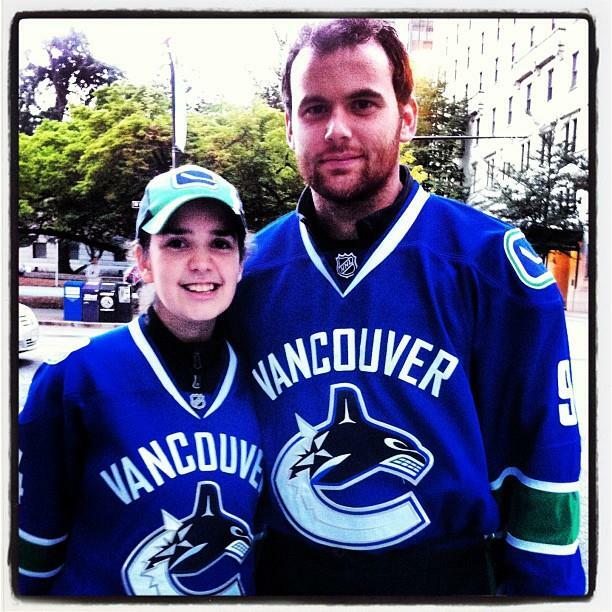 ], Jersey[#9 Kassian], & hat[#7 Booth]! Thanks again David Booth, Zack Kassian, & FIN for an epic start to my day! 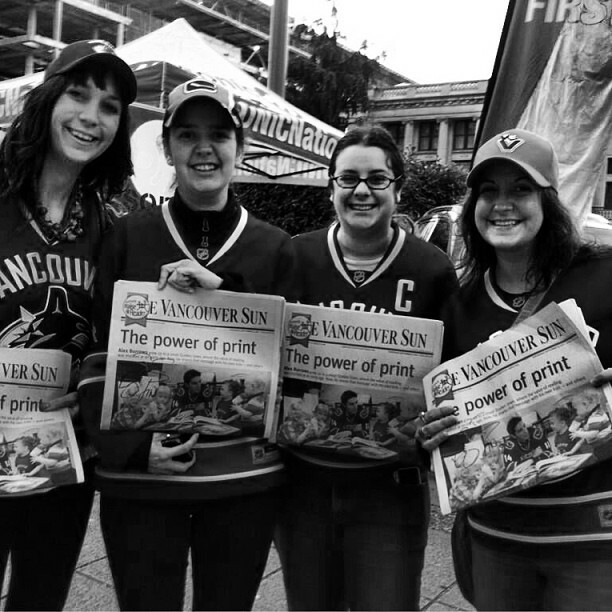 It was great to see so many Canucks fans out there support the #RaiseAReader campaign & supporting the team! Hope to see you all out there next year! 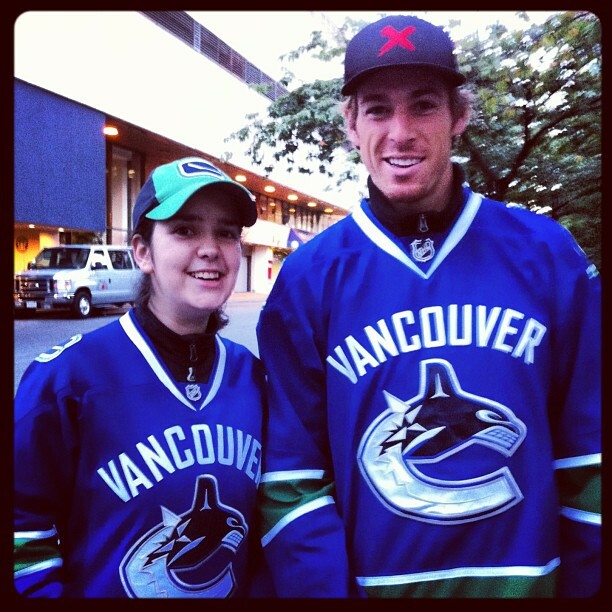 I do not think I can thank the Vancouver Canucks enough for my wonderful morning! It only made me that much more excited for the regular season to begin[despite the lack luster preseason!]. John Tortorella: Head Coach for your Vancouver Canucks! I know I am more than a little late to the party BUT I wanted to wait until closer to the season to post this. I believe it is fair to say that following a Q&A from the fans and his introduction to Vancouver media, John Tortorella had turned a lot of people from their preconceived notions regarding his demeanor. Everyone seemed to be expecting to see the man who hates losing and has put himself into hot water with his words but that was not the man who presented himself to the fans and this city [except of course, he still hates losing as do we all!]. Does he have a past and has he made mistakes? YES, hasn’t everyone?! Tortorella acknowledged from the get go of both interviews that he’s working to change that perception of himself and noted that he doesn’t want to put himself or the Canucks organization in a sticky situation. Every SINGLE time he has addressed the media, EVERYTHING he has said is OVER analyzed. He recently made comments in regards to his dislike for twitter and that he does not want his players to use it too much or leak what’s happening within the locker room. Is it wrong of him to want to keep team dynamics private? I don’t think so. Shortly following what the media dubber his twitter tirade, during another media press conference a cameraman’s cell phone went off interrupting the conference causing Torts to threaten to walk if it happened again. Perhaps a little rash to walk out BUT recently the local media have had little or NO respect for the team. For the first two pre-season games, Torts was not behind the Canucks bench but rather watching from above. Many commentators and fans alike disagreed with this decision. I liked the decision. By watching from above he could get a real sense of this team, the prospects and see what areas need to be addressed before the regular season begins come October 3rd. Things are not going to be the same with Torts at the helm of this team and whatever perspective you had of him before is likely to change. He’s going to run a tight ship and the team will have to work hard BUT perhaps his style is what they need to get that extra push throughout the season and down the stretch drive. Success can be hard to come by in any career but looking at the history of John Tortorella, one can see that he has achieved many success at every level of his coaching career. He has coached the AHL’s Rochester Americans to the Calder Cup victory in 1996, coached the Tampa Bay Lightning to Stanley Cup Victory in 2004 [also won the Jack Adams award in 2004], and helped to coach the US Olympic team to a Silver medal in the 2010 Olympics. NHL coaching record: In the 854 NHL games he has coached, Torts has amassed a record of 410 WINS-340 LOSSES-37 TIES-67 OVERTIME LOSSES. This year with the Canucks, he will surpass the 900 games coached milestone. Let’s hope it’s a big year for Torts and the team! He might not have been the coach that many desired or expected to land in Vancouver BUT he is the coach that chosen for the job. He might possibly stir up the media with a comment or two that they over analyze as they do everything. He might do things that make you question his motives BUT everything he does in regards to the team will be to push them to give their best every game. Will they win every game? Probably not, BUT hopefully each loss[may they be few!] will teach them something and be another push to make them better individually and as a team. Welcome to Vancouver, Torts! I look forward to the ups and downs and all the in between as this new chapter with the team begins! [if you haven’t checked out her blog yet, you should!] It’s an exciting milestone & I wanted to share by nominating a few well deserving blogs! 2. You must answer the 11 Liebster questions given to you by the nominee. 3. You must pick 11 bloggers to be nominated for the award with 200 or under followers. The inspiration for starting my blog came from the the combination of growing tired of the constant negativity that is the local sports media and the encouragement from friends and family. 2. What’s been your greatest challenge on your blog so far? Finding a balance for keeping to a schedule & developing blog posts that will appeal to my readers and draw in new readers. 3. Who is your greatest influence? Social media and the driving force of wanting to support the team in a way the local media has lacked in the last few years. 4. What do you love to do in your spare time? Attending hockey games, writing my blog or just some creative writing when time allows. 5. What big ticket item is on your wishlist right now? A ticket to the 2014 Heritage Classic featuring the Vancouver Canucks and the Ottawa Senators. 7. What is something you’re proud of creating/making/doing recently? Aside from being a crazy hockey nut, I really enjoy cooking & baking. Recently I came up with my own chocolate shortbread recipe & it turned out delicious! 8. Name one thing you couldn’t live a day without. 9. What music are you listening to right now? A little bit of everything but at the moment really enjoying Wakey!Wakey!’s “Almost Everything I said the Last Time I Saw You..” album & Blind Pilot’s “We Are the Tide” album. I’d love to be sitting in the press box at Rogers Arena watching the Canucks take on their latest opponent or perhaps featured on a sports radio talk show! That would be absolutely surreal. Not sure that either will happen but it certainly would be interesting! 11. Tell me a surprising fact about yourself. Last year I started running 3-5 times a week to train for a 10k marathon I want to participate in with my sister in April. My Nominees: Shoutout to my fellow hockey bloggers! 2. Is there something you wish you had known when you first started your blog? 3. What is the biggest challenge about your blog? 4. What is your favourite sports team outside of hockey? 5. Who is your favourite hockey player & why? 6. What is your favourite aspect of the game? 7. Who will you be supporting the 2014 Olympics hockey tournament? 9. If you could choose ANY player currently in the league OR retired to play on your favourite team, WHO would you choose & why? 10. Tell me a surprising fact about yourself. Who is Hunter anyway? Hunter Shinkaruk was selected 24th overall in the 2013 NHL Draft by the Vancouver Canucks. Prior to being drafted by the Canucks, Shinkaruk has spent the last three seasons playing the WHL for the Medicine Hat Tigers. Does that team sound familiar Canuck fans? The answer is YES or that it should be yes because once upon a time that is the very team where former Canuck Captain, Trevor LINDEN began his hockey career and went on to have A LOT of success with Vancouver. Hunter has played in 193 WHL games with the Medicine Hat Tigers and amassed a total of 219 points [100 goals, 119 assists]. His first year his total hit the respectable 42 point mark but was more than double in the next two seasons with totals of 91 points and 86 points respectively. There is SOOOOO much potential with Shinkaruk and I look forward to seeing him represent the blue and green! Hunter’s first [pre-season] NHL is extremely highlight reel worthy! Hopefully we get to see him in the line up scoring many more spectacular goals over the next few years! Shinkaruk has looked good in both the Young Stars Tournament and the pre-season games that he has appeared in for the Canucks. Should he crack the lineup this year…it will be very exciting to watch! Shinkaruk has a very bright future and potentially a big career a head of him and we are lucky enough to witness the beginning. Best of luck this year Shinkaruk, hopefully we see you sporting the blue and green this year!